Scotch Gambit 4...Nf6 5.e5 - Chess Gambits- Harking back to the 19th century! The Scotch Gambit line with 4...Nf6 reaches a position often arrived at via the Two Knights Defence: 1.e4 e5 2.Nf3 Nc6 3.Bc4 Nf6 4.d4 exd4. It can also arise from the Urusov Gambit: 1.e4 e5 2.Bc4 Nf6 3.d4 exd4 4.Nf3 Nc6. 5.Ng5 is not particularly reliable after 4...Nf6, because of the response 5...d5 6.exd5 Qe7+, whereupon White must play 7.Kf1 in order to avoid losing a pawn for nothing, but then Black gets very good compensation for a pawn (which is hard for White to hold onto). With 5.e5, White attacks the f6-knight, encouraging the knight to move to a sub-optimal square. 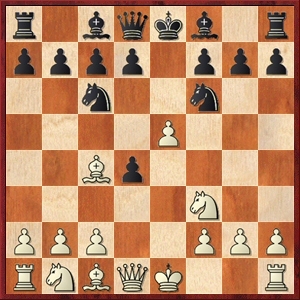 The traditional main line is 5...d5, counterattacking against the bishop on c4, which typically leads to a relatively positional game although both sides have some scope to attack the enemy king. Following 6.Bb5 (6.exf6?! dxc4 doesn't work for White because White hasn't castled yet and the white king is vulnerable to attack down the e-file) 6...Ne4 7.Nxd4, Black chooses between the solid, if rather passive, 7...Bd7, and the more aggressive 7...Bc5. Black has some gambit possibilities after 7...Bc5, though if White avoids being too materialistic and continues with 8.Be3, the sacrifice of a pawn with 8...0-0 doesn't provide enough compensation and so play normally continues 8...Bd7 9.Bxc6 bxc6 10.Nd2 Qh4 11.0-0 Bb6. Black has the bishop-pair and the more active pieces, but White can play against the doubled black queenside pawns and strive to build up a kingside attack, often by pushing the f-pawn. However, since White has not yet castled, 5...Ne4 and 5...Ng4 are both playable as well. 5...Ne4 leads to fairly unbalanced play in which White has gambit possibilities, such as 6.Bd5 Nc5 7.c3! ?, while 6.Qe2 and 6.0-0 are the main alternatives (the most popular line runs 6.0-0 d5 7.exd6 Nxd6 8.Bd5). 5...Ng4 may well be the hardest line for White to crack, and it has been played by grandmasters Magnus Carlsen and Nigel Short. White can head for a queenless middlegame with 6.Qe2, whereupon play usually continues 6...Qe7 7.Bf4 f6, leading to equal play. The main alternative is 6.0-0, which can lead to interesting gambit play following 6...d6 7.exd6 Bxd6 8.Re1+ Kf8, but Black can also consider 6...Be7!? with the aggressive idea of 7.Bf4 g5.